Author: Bank of Albania. Licence: All Rights Reserved. TIRANA (Albania), February 6 (SeeNews) – Albania central bank said on Wednesday it has decided to keep its key policy rate unchanged at record low 1.0%, it said. The interest rate corridor in the interbank money market will also be kept unchanged, set at 0.10% for the overnight deposit rate and at 1.90% for the overnight lending rate, Bank of Albania said in a statement following a meeting of its rate-setting supervisory council. The central bank last changed its monetary policy rate in early June 2018, lowering it by 25 basis points to 1.0% amid strong appreciation of the lek currency increasing downside pressures on inflation. “The new economic and monetary information suggests that the Albanian economy continues on a positive development trend,” central bank governor Gent Sejko said in the statement. Aggregate demand continued to grow in the second half of the previous year, resulting in an increase in production, employment growth and improvement of main economic and financial balances,” Sejko noted. He also said that the Bank of Albania deems that the new information is broadly in line with its expectations. “The Albanian economy grew by 4.45% in the third quarter of last year. Growth was fuelled by the further expansion of private consumption, investments and exports, as well as the annual growth of electricity production,” Sejko said, citing data from the country’s statistical office INSTAT. The expansion of economic activity appears to reflect mainly the increased activity in industry, services and construction, Sejko noted, adding that available data shows that the economy has continued to grow in the fourth quarter as well, although at a slower pace than in the previous quarters. “While uncertainties and risks persist, the external environment appears overall favourable for economic growth at home. The upward demand from the global economy continues to favour growth for Albanian exports, and financing costs remain relatively low,” the central bank governor said, adding that the domestic policy mix remains stimulating. According to Sejko, the situation of liquidity in financial markets has been improving and risk premiums have been trending down. “The exchange rate appeared stable in January, due to a better balancing of demand and supply for foreign currency, and to the response of the Bank of Albania,” Sejko noted. Sejko also said that fiscal policy continued the consolidation trend and fiscal data suggests that budget deficit decreased to 1.6% of the GDP at the end of 2018, standing 0.4 percentage points lower than planned. 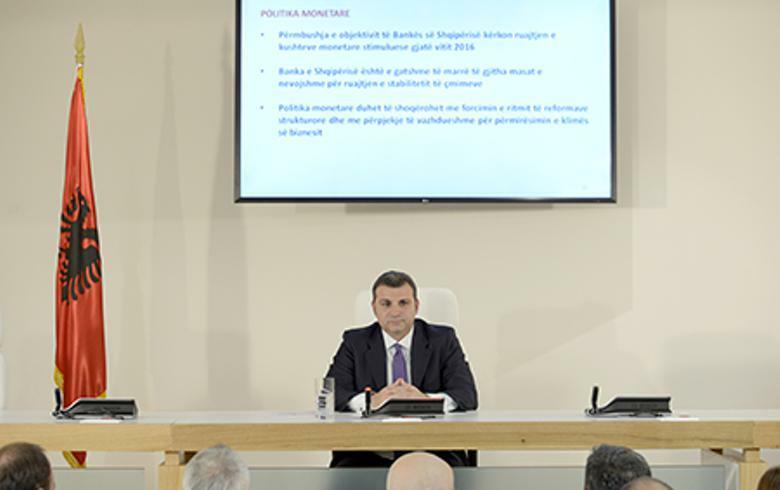 “The Bank of Albania deems that the Albanian economy will continue to grow in the next three years,” the governor said, adding that the expansion in aggregate demand will contribute to further employment growth, creating the premises for rising wages and domestic inflation. The supervisory council finds that the balance of risks remains tilted to the downside, Sejko said.